We are conscious that none of us are worthy of so great a gift, yet we must be prepared as well as possible to receive Christ in the Eucharist. This includes receiving forgiveness in the sacrament of Confession for our sins, for anything that separates us from Christ and His Church. Through the ministry of the Priest, the penitent receives God’s forgiveness, and his guilt is wiped away as if it had never existed. A priest can do this only because Jesus allows him to participate in his own divine power to forgive sins. 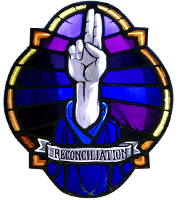 When do Confessions and 1st Penance take place in Holy Redeemer? Confession takes place weekly after 10am Mass on Saturdays. We also have Sacrament of Penance Liturgies at Easter and Christmas (See Seasons for times). 1st Penance take place usually a couple of months before the celebration of 1st Holy Communion in the Main Church.